Here in the Old Margreve, adorable woodland creatures are running hither and yon…FOR THEIR LIVES. 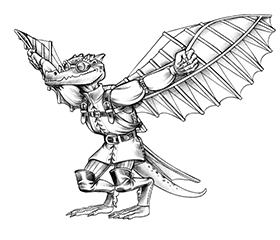 That’s because Kobold Quarterly issue #20 is out today and this time the focus is on archers! With an all-new elven archer base class for Pathfinder RPG, a shadow fey hunting party on the prowl, and new arrows carrying acid, fog and razor filaments, the debate over whether it’s Wabbit Season or Duck Season just became much more energetic. 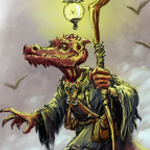 KQ #20 features Jeff Grubb on the lost elves of Midgard, a Q&A with Journeys to the West lead designer Christina Stiles and a new Zobeck adventure. 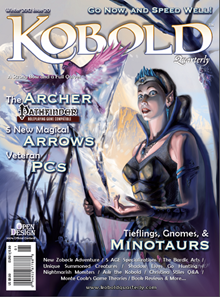 Pick up Kobold Quarterly #20 in print or in PDF. Or hey, why not subscribe? I’m delighted with it as well, mostly because it’s the largest Winter issue KQ has done to date. Also, magical fish. And Monte Cook outdid himself in the Game Theories column. And the Archer class is calling me as my next Pathfinder character. The archer class will work well for Perunalia, as well. So very glad to be a part of this–I think it’s great stuff from beginning to end! Waiting . . . waiting . . . checking the mail box. . . waiting. That archer class is rockin’! I bet the author is devilishly handsome! I liked the Putting the band back together stuff as well as the Servants from beyond. Initially wasn’t that impressed with the Archer because of the elven link(I dislike racial restrictions) but it could easily be adapted, as the article points out, and is mechanically interesting and well designed. I may use it for an NPC I’ve been working on. All in all a well written and presented mag. Nice job on the archer, John! Got my hard copy, always a happy day. And as always, what I can see as a lot of useable content–though I’ve yet to dig into it in depth. Two words: Magic Fish (my fave article by far). It has been incredible to watch KQ grow into what it has become. Purely based on layout and art this is the best issue yet. I also hope all the Kobolds know how much having a PRINT magazine in your hands matters. I own tons of pdfs and a Kindle…still love me some paper gaming mag! KQ rocks! So excited to be a part of this issue, and hopefully more to come! Stellar composition and layout, and a wide range of useful stuff as always. Tomorrow is payday, and tomorrow I become a KQ subscriber! Woot!